If you have any questions about the ALLIANCE information page below please contact us. This 41 metre (133 foot) luxury yacht was produced at Delta Marine Industries in 1989. Motor Yacht ALLIANCE is a capacious superyacht. The firm of naval architecture which delivered the drawings for the yacht was Delta Design Group and John Schubert and Ralph Bladt. The vessel had interior was the talent of Gila Lehrer. Luxury yacht ALLIANCE is a interesting yacht that is able to sleep up to 6 passengers on board and has approximately 6 crew members. 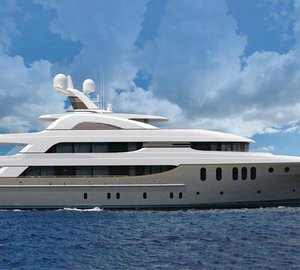 Delta Design Group was the naval architect firm involved in the professional superyacht composition for ALLIANCE. Also the company Delta Design Group and John Schubert and Ralph Bladt successfully worked on this undertaking. Interior designer Gila Lehrer was charged with the creative internal styling. 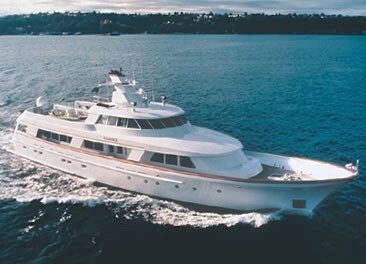 In 1989 she was formally launched to accolade in Seattle Wa and following sea trials and final completion was thereafter handed over to the owner who commissioned her. Delta Marine Industries completed their new build motor yacht in the United States. A moderate proportion is brought about with a total beam (width) of 7.92 m or 26 feet. With a 2.44m (8ft) draught (maximum depth) she is reasonably shallow. The material composite was used in the building of the hull of the motor yacht. Her superstructure over the hull is built with the use of composite. In 1999 further refitting and modernisation was additionally finished. The 3508TA engine installed in the motor yacht is made by CATERPILLAR. Connected to her Caterpillar engine(s) are twin screw propellers. The engine of the yacht produces 1150 horse power (or 846 kilowatts). She is fitted with 2 engines. The total thrust for the yacht is 2300 HP / 1692 KW. As far as stabalisers are concerned she was supplied with Pac-Mar. Bestowing cabins for a limit of 6 visiting passengers overnighting, the ALLIANCE accommodates everyone comfortably. The boat uses around 6 expert qualified crew to operate. 40.54 metres / 133 feet. Total engine power output 2300 HP /1692 KW. The luxury yacht ALLIANCE displayed on this page is merely informational and she is not necessarily available for yacht charter or for sale, nor is she represented or marketed in anyway by CharterWorld. This web page and the superyacht information contained herein is not contractual. All yacht specifications and informations are displayed in good faith but CharterWorld does not warrant or assume any legal liability or responsibility for the current accuracy, completeness, validity, or usefulness of any superyacht information and/or images displayed. All boat information is subject to change without prior notice and may not be current.